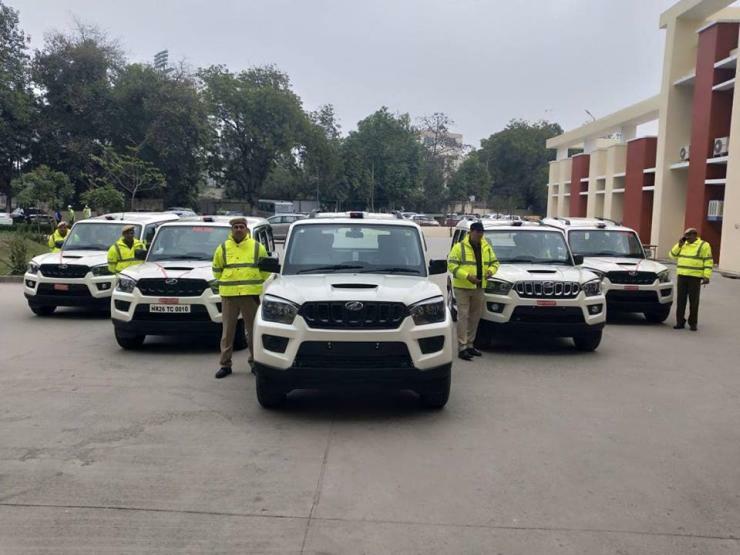 Society for Safe Gurugram, a non governmental organization working to make the Gurugram safer for its citizens, has just donated six spanking new Mahindra Scorpio SUVs to the police force of that city. All 6 Scorpios were inducted into Gurugram’s police fleet on the 22nd of February, 2019. There are no clear details about the variants of the Mahindra Scorpio that has been inducted into the police fleet. 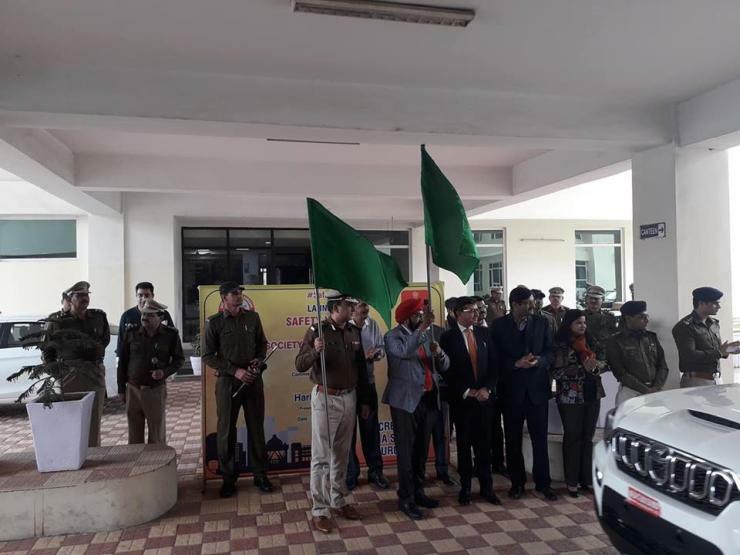 Notably, the Gurugram police force recently inducted many new Maruti Ertigas. The Scorpio is a totally different car compared to the Ertiga though. The Scorpio is a tough, macho looking SUV that is bound to bring in some intimidation factor when used by law enforcement officials. Police forces of many cities in India use the Mahindra Scorpio, with Hyderabad being a prime example of the new Scorpio being inducted into the city’s police fleet. The Mahindra Scorpio is available in multiple variants – S3, S5, S7, S9, S11. The S3 variant is aimed at taxi fleets, semi-urban and rural markets. The Scorpio in S3 trim is powered by a 2.5 liter M2DICR turbocharged diesel engine that makes 75 Bhp-220 Nm. A 5 speed manual gearbox and a rear wheel drive option is standard in this trim. Prices of the S3 variant start from Rs. 10.09 lakhs. The S3 variant, which while being quite under-powered compared to other variants of the SUV, is a top seller. This is because the Scorpio has a massive market in India who buy this SUV for the image it offers rather than engine performance or features. The S3 is also the only Scorpio model to be offered in 7 seat and 9 seat models, and this indicates that the SUV is also aimed at the taxi market. Moving up the variant chain, all other trims of the Scorpio use the 2.2 liter mHAwk turbocharged diesel engine that’s a lot more powerful. While the S5 and S7 variants get the mHawk diesel engine in 120 Bhp-280 Nm state of tune, the S7 also gets the engine in a 140 Bhp-320 Nm state of tune, but the S7 trim in this state of tune is priced higher. While the 120 Bhp mHawk motor uses a 5 speed manual gearbox, the 140 Bhp tune gets a 6 speed manual gearbox. All trims of the Scorpio using the mHawk diesel motor get a rear wheel drive layout as standard while the S11 trim gets a four wheel drive transfer case as an option. The S11 4WD variant is quite pricey though, and costs Rs. 16.37 lakhs, ex-showroom Delhi. Mahindra has begun working on an all-new Scorpio. The all-new Scorpio will continue to use a body-on-ladder chassis but will get a new platform. It will make its debut in 2020, and is expected to pack in a brand new 2 liter turbo diesel engine that will meet Bharat Stage 6 emission norms. The 2020 Scorpio will also share its platform with the new Thar.